Playing outside is a year-round activity. This girls' jacket gives kids an extra layer of warmth through the winter. It has a rugged canvas construction that's lined with soft sherpa. The insulated front pockets give her a place to heat up her hands or hide away small treasures. This coat fit my daughter perfectly, looks great, and is plenty warm enough for her with it getting colder out. I got this jacket 3 years ago for my daughter and it lasted for two years until she outgrew it. I reordered or this year and she loves it. She’s only 4, but this is her favorite jacket, sometimes she won’t even take it off she loves it so much. I would definitely recommend buying this jacket to a friend. The durability, fit, warmth, comfort, everything is worth the money. It's an infant jacket, but very authentic. Looks warm but we will have to wait until the baby arrives in Sept/Oct and get her opinion ! :) Carhartt is unbeatable, we all know that ! The picture shows my 1 year old wearing the 6 month size. She is about 18 lbs, 29 inches. Love the quality. The wrists are little tight, but that's our only complaint. Love it! Fits my daughter great and keeps her warm! This coat couldn't come fast enough. 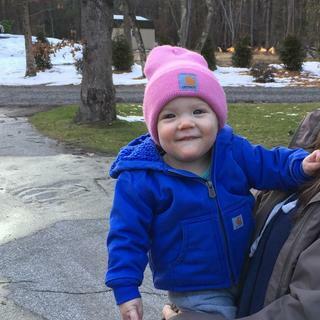 We live on a farm in a Canada and Carhartt is the best product that is warm and durable enough to stand up to the wear and tear we put on outdoor clothing. It's also the only company that we have found, that make this type of outdoor clothing in children's sizes. The only suggestion I have, is it would be really nice to have an insulated snow suit option that goes up to children's size 5 or higher. We would have ordered that instead. I bought this for my 5 month old in 6 month size so she can fit a sweater under it. I love the lining, soo soft! Great quality cute jacket that isn't too stiff. Arms are a little long but my daughter is on the petite side. Would definitely recommend to a friend. Is it water proof (for the rain)? Is it true to size guide? I have a 14 month old that is 25 lbs. BEST ANSWER: We would recommend following the size and fit guide with the child's weight and height. They acually run bigger! Which I actually enjoy bc for the price you get to wear it for longer. We purchased the 24 months was a bit big but hoping to get this winter out of it too! Can my toddler wear this coat in the car seat or is it too thick? BEST ANSWER: My ten month old wears it in the car seat. The jacket likes to ride up at all times, so as you tighten the straps to the car seat just make sure to hold the jacket down so it doesn’t bunch around their neck. And also make sure the good is up so it doesn’t prop their head forward. But short answer is yes. It is too thick and the shell is too firm for a carseat, but it is very warm and snow doesn't stick to the toddler coat and overalls. Yes she could and it’s super cute..
What's the difference between 24 Month and 2T? The for guide has same measurements. BEST ANSWER: They are both the same in terms of sizing. The 24 month options will be more aligned with our infant styles, whereas the 2T styles will look a bit more like "big kid" clothes. Does this jacket keep kids warm in the snow? BEST ANSWER: It keeps them warm, but I would shift to a warmer, insulated jacket once the temps go below 30. This isn't bad for those times, but they will get chilled if not moving around. I would imagine so, it seems to me as warm if not warmer than my Cerhartt jacket with sherpa. Yes it does but if playing in the snow I would layer up just like any other coat. Yes, this is an excellent jacket for kids in the cold/snow. Do these run big or small? I really need a 9 month old size. BEST ANSWER: Our kids' jackets are true to size. We recommend selecting a size by height and weight measurements. Are the arms sherpa lined as well? BEST ANSWER: No, the sleeves are lined with polyester quilted taffeta. This makes the garment easier to take on and off. The arms are NOT Sherpa lined.